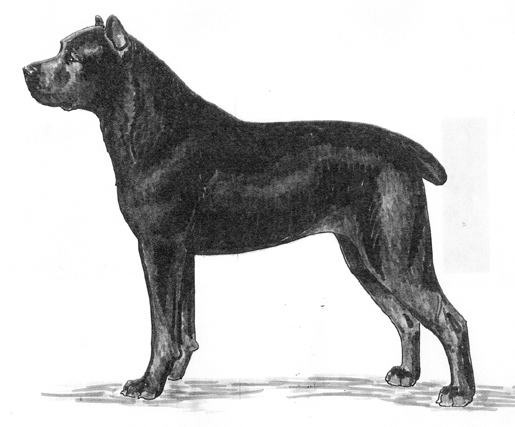 The Cane Corso Italiano is descended from the old Roman Molossian. Formerly scattered all over Italy, in the recent past the breed has only been popular in the Province Apulia and the adjacent regions of Southern Italy. The breed name is derived from the Latin ‘cohors’ which means protector and guardian of the farmyard. Today the breed is used as a guardian, protection, tracking and police dog. 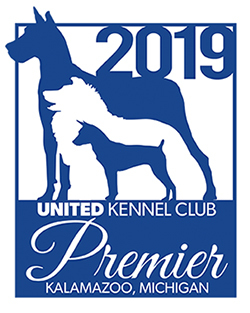 The Cane Corso Italiano was recognized by the United Kennel Club July 15, 2008. A medium to large sized, robust, sturdy dog that is somewhat elegant and has lean, powerful muscles. The breed is extremely responsive and agile. It is used as a guardian of family, property and livestock. In the past, it has been used for herding cattle and hunting big game. The head is large and typically molossoid. The planes of the skull and muzzle converge slightly. Serious Faults: Parallel planes of the skull and muzzle or planes that converge too steeply. The skull is broad; at the zygomatic arches its width is at least equal to its length. Convex in front, the skull becomes rather flat behind the forehead to the occiput. The frontal furrow is visible and the stop is marked. The muzzle is noticeably shorter than the skull (ratio of 1:2). It is strong, square and flat, as wide as it is long, with a straight nasal bridge. There is no taper in the width of the muzzle from stop to tip. The upper lips hang and cover the lower jaw so that the lower profile of the muzzle is determined by the lips. Disqualifications: Bridge of nose that is convex or concave. The Cane Corso Italiano has a complete set of evenly spaced, white teeth meeting in a slightly undershot bite. The jaws are very large, thick and curved. A level bite is acceptable but not preferred. Serious Faults: Scissors bite; severely undershot bite. Large and black with open nostrils. Disqualification: Nose pink, without pigmentation. Medium size, and oval in shape, the eyes are set to look directly forward and are slightly prominent. The eyelids are close fitting, and the iris is as dark as possible, depending on the color of the coat. The expression is keep and attentive. Disqualifications: Wall eyes; complete or partial lack of eyerim pigment. The ears are triangular and drooping, wide at the set on, which is high above the zygomatic arches. They are often cropped in the shape of an equilateral triangle. Strong and muscular, the same length as the head. The shoulders are long, oblique and very muscular. The upper arm is strong. The legs are straight and very strong, with elastic pasterns. The body is somewhat longer than tall, sturdily built but not squatty. The chest is well developed and reaches to the elbow. The withers are pronounced, rising above the level of the croup. The back is very muscular and firm. The loin is short and strong and the croup is long, wide and slightly sloping. The upper thighs are long and wide, and the back of the thigh is convex. The lower thigh is strong, and not fleshy. There is moderate angulation at the hock, and the rear pasterns are thick and sinewy. Cat feet, with the rear feet less compact than the front feet. The tail is set on fairly high, and is very thick at the root. It is generally docked at the fourth vertebrae. In action it is carried high, but not curled or erect. Serious Faults: Ring tail, or tail carried vertically. Short, shiny and very dense, with a light undercoat. Disqualification: Semi-long or fringed coat. Black, all shades of grey and fawn, stag red and brindle. In fawn and brindle dogs, the black or grey mask on the muzzle should not go beyond the line of the eyes. A small white spot on the chest, white on the toes and on the bridge of the muzzle are acceptable. Disqualifications: Any color not specified in the standard; large white patches. Height at the withers for males is 25 to 27 inches; for females, it is 23.5 to 25 inches. One inch over or under the preferred size is acceptable. Weight for males is 100 to 110 pounds; for females, it is 88 to 100 pounds. Serious Faults: Oversize or undersize. At a trot, the gait is extended, with a long stride. Bridge of nose that is convex or concave. Wall eyes; complete or partial lack of eyerim pigment. Any color not specified in the standard; large white patches.